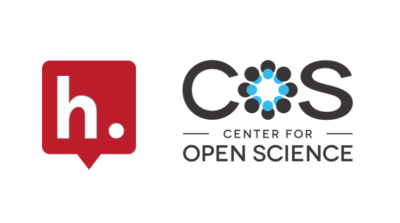 To enable peer feedback, collaboration and transparency in scientific research practices, Hypothesis and the Center for Open Science (COS) are announcing a new partnership to bring open annotation to Open Science Framework (OSF) Preprints and the 17 community preprint servers hosted on OSF. The partnership enables researchers to engage with each other, discuss research and share additional information as part of the regular research workflow. Services currently hosted on the OSF Preprints platform include AgriXiv, Arabixiv, BITSS, EarthArXiv, EngrXiv, FOCUS Archive, FrenXiv, InaRxiv, LawArXiv, LISSA, MarXiv, MindRxiv, NutriXiv, PaleorXiv, PsyArXiv, SocArXiv, and SportRxiv. The partnership builds on the foundations laid by the publication of web annotation as a standard by the W3C, and the pioneering work by Hypothesis to build an open annotation infrastructure and by COS to offer OSF, a comprehensive platform for open scientific research and publication. Hypothesis and COS plan to launch initial annotation capabilities for OSF Preprints and the eighteen partner services hosted there in the first half of 2018, building on preliminary work already tested by both partners. This announcement builds on a community discussion held 25 January 2018 at the Sloan Foundation offices in New York City. There, many of the scholarly preprint services gathered in person or remotely to discuss potential benefits and considerations in bringing annotation to article preprints. A summary of the conversation is available in a blog post. Hypothesis is a US 501(c)3 non-profit organisation dedicated to the development and spread of open, standards-based annotation technologies and practices that enable anyone to annotate anywhere, helping humans reason more effectively together through a shared, collaborative discussion layer over all knowledge. Hypothesis is based in San Francisco, CA, with a team distributed worldwide.